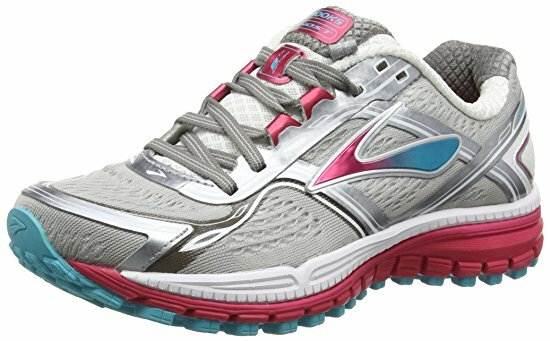 Brooks is famous for their running shoes whether for long distance marathon training, short sprints, or just plain walking. Brooks knows what amateur and professional runners and walkers need in an athletic shoe, and Brooks maintains the integrity of their running shoes with ongoing technology for support, fit and pure comfort. The Women’s Ghost 8 Running Shoe combines all three of these aspects in its outstanding line of women’s running shoes. Brooks has mastered the art of the perfect athletic shoe. It has a solid platform from which it builds its shoes and makes subtle yet critical improvements with its products over time. Shoe fabrication is reassessed and technological changes are integrated into the original shoe platform, which are geared towards a number of principles that promote production of the perfect running shoe. With the Women’s Ghost 8’s shoe, it is categorized as a shoe for individuals with neutral and underpronator needs as well as for those with medium to higher arches. The shoe works to help cushion the foot with its BioMoGo DNA structure that basically acts as a built-in cushioning base that conforms to the runner’s individual foot needs whether they are categorized as neutral, underpronated or high arches. Whatever the needs, the cushioning is tailor made to the individual, even during running activity. In a neutral pronation capacity, which is the most standard and efficient type of pace, a usual heel strike is one in which a runner hits the ground on the lateral (outer side)of the heel. As a person shifts weight from the heel to the middle part of the foot (metatarsus),the foot rolls towards the middle and the weight is evenly distributed across that area. From there, the knee usually situates itself over the large toe area. Neutral pronation is the description of that process, and the Brooks Women’s Ghost 8 is designed to adapt itself to that kind of activity. As far as underpronation and higher arch needs, once again the MoGo integrated cushioning compensates and adapts to the underpronation (rolling outward), and medium or high arch issues. Who would buy the Ghost 8? Women of all ages and backgrounds would be interested in buying this athletic shoe because of its superior fabrication and technology driven features, which make involvement in any athletic endeavor worth their while. Other women would purchase this shoe for the same reasons, but it would also be of interest to those with underpronating issues (foot rolling outward at the ankle), as well as for those who have medium to high arches and want to protect that part of their feet with the extra cushioning in this shoe. The shoe would not be limited just to women involved in running, walking and other athletic activities, as professional and amateur athletes would most probably utilize these running shoes in various competitions, not just for everyday practice sessions. Women would also buy this shoe to improve their cardiovascular and overall muscular health, knowing that this particular shoe would indirectly provide them with the benefits necessary for a healthy lifestyle. Other women would probably use these shoes for taking walks, pushing their babies in carriages, and playing sports with their older children in a park or backyard. Some working women would purposely use these Ghosts to switch off from their professional dress higher heels to a more comfortable shoe, so they could go to and from work in comfort. Any woman would be thrilled to wear and languish in the comfort of this Ghost 8 shoe, whether running a marathon, running errands, or just running for the fun of it, and they would probably wear them until they were worn down to nothing, which is hard to do for a Brooks shoe. Feedback is excellent with this particular Brooks running shoe. Almost 80 percent of those purchasing the shoe, gave it a five star rating; 9 percent gave it a four star rating; 5 percent gave it a 3 star rating; 2 percent gave it a 2 star rating, and 5 percent gave it 1 star rating. The overall star rating was 4-1/2 stars for the Women’s Ghost 8. Eighty-seven percent of buyers also noted that the shoe fit as expected, and they were pleased with the perfect fit and comfort of the shoe.